Last Thursday we had just returned home from our morning walk-about, when we received a call from our district leader for us to get to Kiev- and to hurry like we had to be there thirty minutes ago. We had no idea what was going on. We knew that there was a special open house for the VIPs but we didn't think that they would need missionaries for that event. Because of the urgency of the call we called a taxi and got to Kiev in an hour and a half, to find that they needed us to replace sisters serving in the cultural hall who needed to go on a lunch break. I was kind of disappointed that it wasn't more exciting than that, oh well, I think eating is important too I guess, but I wanted to go in the temple! So we stayed in the cultural hall for the rest of that day and on Friday too. And on Saturday too. They just want us there to answer questions and help people if they ask for help. We are not allowed to hand out literature or to proselyte. The VIPs had a catered buffet, and when the temple opened for the public, they get a mini pie/cookie and a juice box. No one has asked me very much, usually they ask for a Book of Mormon, that we can not give them, only if they fill out on the comment card and request for one, then some time in the near future, missionaries in their area can deliver it to them. The most interesting question I received was from non-members who asked about polygamy. I simply replied that that was a long time ago and we do not practice it anymore. It has been fun to try to spot the Americans from the Ukrainians or the non-members from the members. And then try to find out if I'm right or not. Can you tell I get kinda bored? But I don't care because this is what I have been waiting for my entire mission! The temple open house and dedication! So if I get to be a part of it in just a little way, I am grateful. I will be working there every day this week except for today and Wednesday. So that is a two hour hot marshutka ride to and from every day. I was telling a visiting American couple this, and they were amazed, and said that I would be blessed. I can see the blessings already. Finally after our shift on Saturday, we waited around a little bit longer for our Billa Serkva branches to arrive so we could go on the temple tour with them. I am so glad we waited because along with some of them, my former companion, Sis. Visotska, and her son were on the tour with us, as were Lena, Ira, and Tonya from my first area. The temple was more beautiful than I had imagined. They had a hard time finding carpet in Ukraine, so most of the flooring is stone, there are so many hand painted details and classic Ukrainian hints in the design as well. For example, patterns of wheat on the walls, blue and yellow in the stained glass, and even a little bit of the Ukrainian cross stitch shown in a few places. My absolute favorite part of the tour (that was unexpected) were the member volunteers who stood at several places on the route of the tour so that people don't wander off. They stand so reverently with smiles on their faces and a sparkle in their eye. They nod their heads when you say diyakoyou (thank you) and I feel the spirit so strong from them. They love their temple so much and I am so, so happy for them. Back to Billa! On Sunday a lady who had come to church with her member-friend last week came again and this time, without her friend. 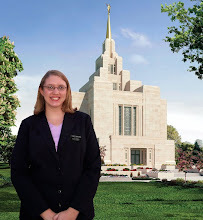 I sat by her during Sacrament Meeting and during one of the talks, where the member was reading from the Book of Mormon, she leaned over to me and asked, "Can I read that book?" Of course! Right after the meeting I ran and got her one and set up a meeting to tell her more about it tonight! Pray for her please!